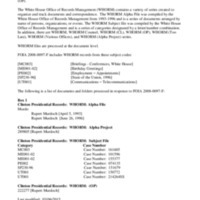 This collection consists of correspondence, memoranda, and faxes dealing with the relationship between media mogul Rupert Murdoch and President Clinton. Topics covered include Murdoch’s favorable comments about Clinton’s 1996 State of the Union speech and his being honored as the first recipient of the Steven J. Ross Humanitarian Award. However, there is very little in the way of factual information about what may have transpired between Murdoch and Clinton in the matter of meetings and personal exchanges.